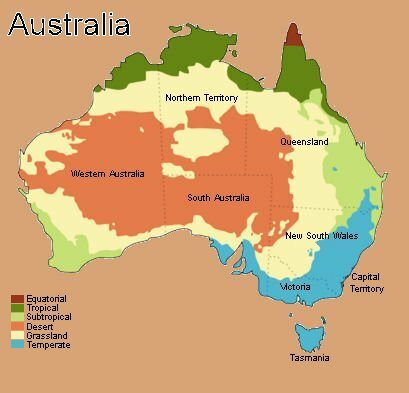 Australia Climate, Weather Zones and Australian States Climatic Conditions. In Australia there is a wide variety of weather conditions. It can be either very cold or extremely hot and dry. In the south the climate is moderate with cool, wet winters and hot, dry summers. In the north the climate is mostly tropical with dry and wet seasons. The monsoon influences the north-west, while there is even snow in the south-east. The temperatures range from 30°C in the summer, to 6°C in winter. The deserts can stay without rain for years, but when there is rain – there can be floods. As Australia is in the Southern Hemisphere, its seasons are just opposite to the ones in Europe and America. During the dry season (April – October), it is suitable to visit the Northern Territory and Queensland, with its rainforests and beaches. While some countries enjoy temperate climates, others have varied weather patterns. That is not to say that varied weather conditions are always bad. In fact, some countries with these conditions may be blessed with an exceptional selection of flora and fauna. This is exactly the case with Australia. With low fertility levels as well as varying weather patterns, this country enjoys a diverse array of natural resources. In fact, it is included among the few megadiverse countries in the world. This means that a lot of animal and plant species in Australia cannot be found in any other country. While the Australian weather varies, most of this country’s area is covered by desert. Dust storms as well as large tornadoes visit several regions of Australia from time to time. Rain is often very variable in this country. This is exactly the reason why droughts are a common phenomenon here. Unlike other deserts, Australia is blessed with stable atmospheric pressure. The combination of high pressure systems and low rates of evaporation means that residents enjoy a moist atmosphere in a desert, without being bothered by frequent rainfall. In general, this unique balance is due to the cold waters off the western coast and the wealth of warm oceans around this country. While the temperature in Australia can reach sub-zero, they can also climb to 50 degrees Celsius. Since there are a lot of warm oceans surrounding Australia, you can expect the weather to be warm most of the time. This is also partly because the mountainous regions of this country are not that high. For more detailed information please refer to a particular state climate & weather page or to an individual city or resort in Australia.